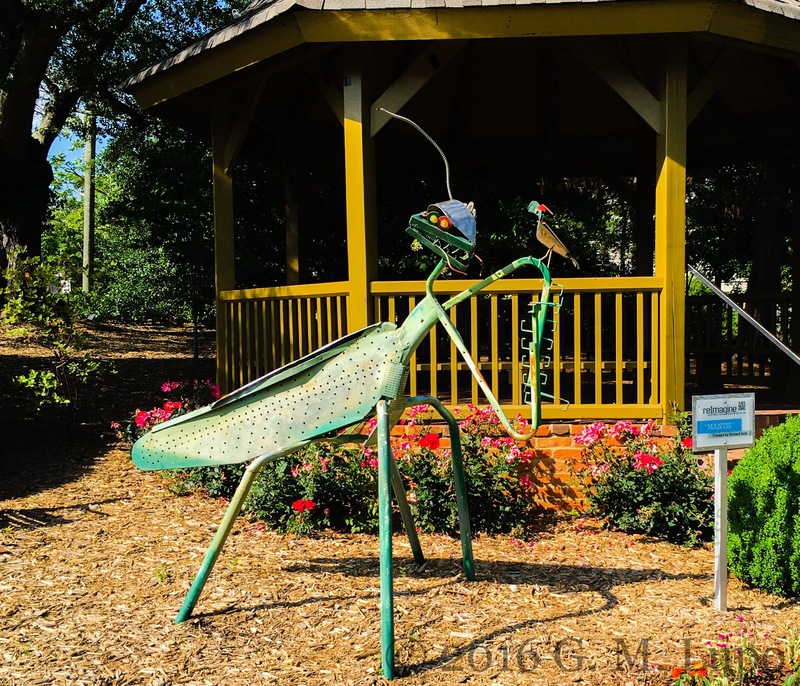 Sculpture entitled Mantis, Norcross, GA, Artist: Richard Sells. Photographed 14 May 2016. People frequently question the so-called “will of God” and are often confused over the direction God seems to be guiding their lives. Schizophrenics often hear voices that they frequently identity as the “voice of God” but for the rest of us, deciphering what God intends for us becomes a matter of interpreting vague signs and symbols either recounted in religious texts, or derived from confusing natural phenomena which seems to have a bearing on our experiences. In either case, we’re trying to gather from external factors messages which, if sent by a higher being, should be clear and unmistakable. The early Middle Eastern inhabitants who wrote the Bible frequently derived an “ought” from an “is” meaning they assumed that since conditions were a certain way, that’s how God intended them to be. Many people today still hold to this belief. For instance, when the Bible was being written, childbirth was painful and difficult and oftentimes fatal for mother and child, which is why polygamy was not only tolerated but encouraged in that society. The people writing the Bible simply assumed this was how God intended it and invented reasons, mainly the “fall of man” and the “curse on Eve” to explain it. Now, science and technology have made childbirth less risky, but often people reject the science because it goes against the Bible. They choose to forego advances that could benefit both mother and child simply because an earlier generation didn’t have such innovations and determined that God wanted it that way. If God truly has a plan for our lives, it makes more sense for God to reveal that plan in unambiguous terms rather than leave it for us to sort out with limited clues and vague signs. It defies logic for a higher being to operate with a hidden agenda when the health and well being of its creations are at stake. If events in our lives are part of a higher purpose, doesn’t it make more sense for the entity behind it to reveal that purpose so we can better work toward it? Humans are deceptive and operate at cross purposes for their own benefit. A higher being that sees all and knows all and is unchangeable has no incentive to be so mysterious. The belief that this entity would reveal its plan to only a select few flies in the face of the remarkable amount of cultural diversity on the planet. Why is modern Christianity or Islam considered superior to the fertility cults and ancestor worship our forerunners practiced, since those were closer to the cultural identity of the tribes to which they belonged. I follow a doctrine of personal responsibility. Each individual is responsible for the consequences of his or her actions and therefore must be keenly aware of the effect we’re having on others. Such vigilance isn’t easy, as even the slightest of actions can have repercussions. We interact with hundreds of people on a daily basis directly and indirectly and it’s next to impossible to know how each person we glance at in the street, or brush up against in an elevator will react to this relatively harmless interaction. This raises the question of our responsibility when our actions have unintended consequences. In 1989, actress Rebecca Schaeffer had no reason to anticipate that her decision to pursue more adult roles in films would result in her death, when a deranged stalker she’d never met took issue with her recent film work and showed up at her front door with a gun. The responsibility for her demise rests solely with the individual who pulled the trigger, then bragged about it in police interviews, but it does point out how seemingly innocent decisions can have consequences we can neither anticipate nor guard against. Being mindful of our actions perhaps involves a bit of empathy, putting ourselves in someone else’s shoes to imagine how that person might react to what we say and do. For some, this falls under the category of “political correctness” and thus invites ridicule. People believe they should be allowed to “speak their minds” and others should just “toughen up” or “get over it”. These same people often react with cries of persecution when the tables are turned, completely failing to appreciate the hypocrisy of their actions. It’s always okay for us to marginalize someone else, but never okay when that person returns the favor. Rather, I question how one goes wrong by being courteous and giving someone else the benefit of the doubt. Whatever the status or intent of a supreme being, we are a society of individuals and must behave accordingly. Perhaps one lesson we can derive from Christianity is the instruction to “do unto others as we would have them do unto us” which causes us to consider how we would prefer to be treated and to apply that standard in our interactions with others. Personal responsibility rests with the individual and one of the best ways to exercise that is to see ourselves as others see us. We, at least, have the ability to communicate clearly and unambiguously. We owe it to our fellow beings to at least make the effort.